I am jealous of you Razmo. Last time I played with a Peak in-store I did seriously question my spending on modules for the previous 4mths. It is the sort of synth I could program a texture on, hit a note and let it sit and evolve over a period of 5min, very happy that it'd be creating a sound which would engage the mind and not become just a drone in the background. But drones are cool too... especially if you're into Ambient stuff ... but yes... that is also the impression I've got from watching a lot of demo's of the PEAK over the last week or two... it has a really big potential, and it certainly has all of the elements I'd look for in a unique hybrid synth... it only have the Prophet 12 as a contender in it's price range, but even then, those two are still quite different with each their strengths and weaknesses... so I WILL be getting myself a Prophet 12 one day in the future. Now I need to read through the amazing amounts of text you have posted after your reply to my post. I am a astounded as to the amount of typing you did today! I'm forever grateful that my mom saw the direction everything was headed and made me take a typing class in high school. Looking good. How do you like the Peak so far? Wow, that is so clean and tidy. I must admit I’m getting to the end of hundreds of cables and patch bays where really all I need is something like that. I was just asking because my first impression of it at Superbooth 2017 was a bit meh. But that encounter also didn't take place under ideal conditions, as my time with it was rather limited and I was sitting in an extremely crowded room. I do remember the solid build quality, though, and I liked the filter and the effects. Dave Spiers' recent presets made me curious again. Believe me, I've been there as well... i just could not stand the clutter at last, so I've made a deal with myself; 3 synths connected at once, and I want ALL to be within arms reach... I accomplished that goal now... I have keyboard and mouse in front of me, a REV2 right behind those (with keys) and a 4K monitor behind that, and monitors placed at each side... to the left as you can see, I've got a small laptop stand which fit the last two synths which MUST be desktop units. I managed to find a special MIDI Y cable which I use from my REV2 MIDI DIN output, so that I can connect it and control both desktop modules from the REV2's keyboard (I'm not using MIDI in my DAW anymore, only audio recording... i only use USB MIDI with my computer for editors). That saved me from buying a MIDI THRU box, or daisychaining them. This means that all three synths trigger when i play on the keyboard, but I simply turn down the volume on those I do not use when recording... no big deal, and it also allow me to easily layer the three if I want to. I'm not sure yet if the REV2 will be exchanged for a module version at some point, that depend on what I decide to do about Prophet X or Quantum. But summa summarum; I'll always be getting new synths... I simply cannot control that part, it will always be like that... but those not in use will simply be stored while not in use. Yeah, to be fair: My first encounter with it took place under less than ideal conditions. And I generally don't care too much about isolated elements either. It's just that a filter sweep and messing around with a reverb and a delay is done quicker than building a complex patch from scratch in a noisy environment. To actually sit (or stand) and play with one actually turning the dials and playing with a keyboard is so much better than watching a demo anywhere. I hadn't been taken in such a way since I plugged in my XTk for the first time. It's one hell of a programmer's synth! I have been looking at the SysEx request and dumps of the PEAK tonight (well... it's almost morning now)... This was what I was most scared about, getting a PEAK since Novation will not part with the specs, even if you ask them (I've read somewhere)... I needed to know a bit about this before I took the plunge and bought a PEAK, so I accidentally found a reverse engineered spec for the Bass Station 2 and assumed that it would probably be very close, and it did look to work well with SoundDiver which I'll be doing an editor for, so I took the chance not fully knowing if it would be the same for the PEAK. I did look at the hex values of a PEAK program dump prior to buying too, and it looked promising. ...and it was... it was actually quite easy to reverse engineer both request and dump sysex strings... the only one that gave me problems was the request macros, but I simply loaded the demo of the one editor available for the PEAK at the moment, and used a LoopBack app to steal the request macros... piece of cake really. So I've set up the basics for the editor... I can now request both Settings, Current Patch and all four banks of patches, and I can send them back as well. The next job (when I've slept) will be to analyze all of the single parameters and write a table with settings and bitfields... That will take some time (it always does when you have to analyze it)... it's a tedious job... have to request the current patch and look at it's hex values, then change a parameter on the PEAK and request the patch again to see where in the dump the change occurs... write down the offset, range and bitfield... for each and every parameter. PEAK has a patch storage size of exactly 512 MIDI bytes... though a great deal of them (about a fourth to a third of them) do not seem to be used yet, so there is definitely space left for future additions... if any will ever come... One thing I'd like to see as a new feature in PEAK is a modulation sequencer like on the REV2/Evolver. I think I've found my dream synthesizer... yes... Novation PEAK... that machine simply shines beyond anything else I've seen so far in aspects of everything... I'm not going to name all the things I like about it because it would be a lengthy list to be honest... still, the only thing i would wish for is a modulation sequencer... other than that, I'm 100% satisfied with this synth. 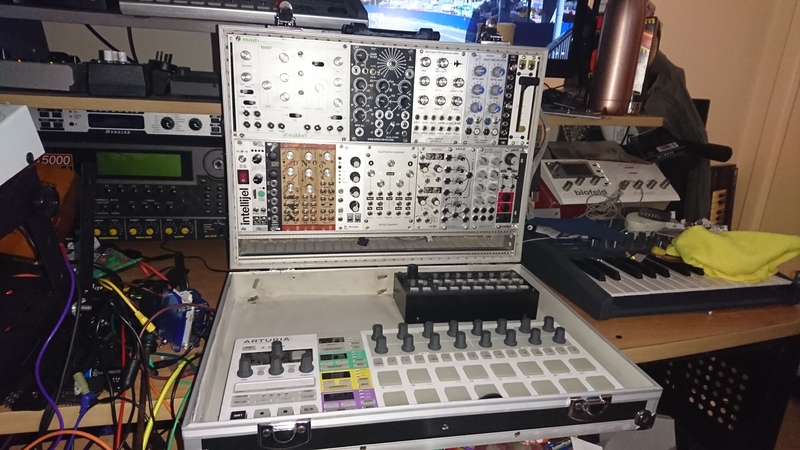 In fact it's so good I'm heavilly thinking about changing my 3-synth setup to be a very simple one consisting of a synth with a good quality motherkeyboard, and some kind of ability to use sample synthesis which is basically the only thing not on the PEAK... I'm not going for a Prophet X... I simply cannot deal with the 8DIO thing of this machine, so it'll be the Waldorf Quantum... that synth gives me sampling and a few other synthesis types that PEAK does not have, and a high quality TP/8S FATAR keybed. The last two synths will simply be two PEAKs... yes... two! ... the only thing I cannot do with the PEAK that I love about the Sequential/DSI synths is dual layering... but with two PEAKS, and them connected to the Quantum via my special MIDI Y cable, I'd basically have a 3 layer combined synth. I'd be free from the mediocre FX of the REV2 (which will go) as the PEAK has superb FX for Ambient stuff, and thus I can also omit the usage of FX plugins in my DAW, using the DAW only for audio recording of tracks. This small and compact setup has huge potential for what I want to do... I could stop buying synths right there, and just focus on these three synths, which will also be good for me... I'd rather be a master of two, than jack of all trades on an ocean of synths really. Tempest should go as well... stupid as it may sound... but I can do percussion just as well with both PEAK and Quantum with both synthesis and samples... I'd be free from all that irritating SysEx editor s*** ... The Quantum has a huge color touch screen, so an editor will not be necessary, and PEAK is so easy to edit from the front panel that an editor would not be needed really... even though I'm doing a SoundDiver adaption for it, just in case i want to use it. Yeah yeah... i know you're thinking "he's changing it all again"... yes I am... but this is it... I want it this way now, I can feel it... so that's where I'm aiming at now... The Quantum will be a while, as it's expensive, so I'll aim at the second PEAK first, and selling the Tempest, and then use REV2 as master controller until the Quantum is here. From there, the only other thing I'll need is a microphone for recording samples for the Quantum... then I'm done... set for what I should have been doing for the last 25+ years: MAKE MUSIC! I give this setup....two weeks before another “This is it...” post. I HAVE to say "You're wrong!" FWIW, I loooove the Quantum so far, and it's really almost eliminated my GAS. Can you say a bit about how the Sample import works? have you looked into that? ... are you using the same SPECTRE app like with the Blofeld for this?